From a strategic point of view Get-Acl (Access Control List) is a stepping-stone to changing permissions with Set-Acl. When learning about Get-Acl select a file rather than a folder, those SID numbers can be so meaningless. I have chosen the Windows log files as vehicle to test Get-Acl. Note 1: The reason that I used the variable $Files is that I want to remind you to change the value for the path before running this script on your machine. Note 2: -MemberType *Property filters out methods, and shows just the various properties. One conclusion, PSChildName may be better than PSPath. Note 3: Actually, any file will do to check the properties supported by Get-Acl. The reasons that I chose -Match ‘Administrator’ is that every Windows operating system has Administrators, and I don’t know the names of your users. Note 4: I recommend that you change ‘Administrator’ to the name of a user on your computer. Furthermore, if you take my advice then you may wish to change the value of $Files to "C:\Windows\Users\"
Note 5: PowerShell syntax includes the ` backtick for word-wrap; however I try not use the backtick symbol `, instead I ended line 4 with the | pipe symbol. As a result of this formatting PowerShell realizes that the command continues on the next line. In addition to pure research on PowerShell's Get-Acl, I strongly recommend that open Windows Explorer and look at not only the location of the files, but also at the permissions. The problem: We need a list of all the permissions on a user's folder, especially any domain\username and group names. The basic command in Example 3a does not produce the desired results. One reason for research properties is if you want to modify the results, for example you wish to pipe the output into Format-Table, but are unsure which properties to specify. Checking the help file will reveal useful parameters, for instance the -audit switch maybe useful for your task. 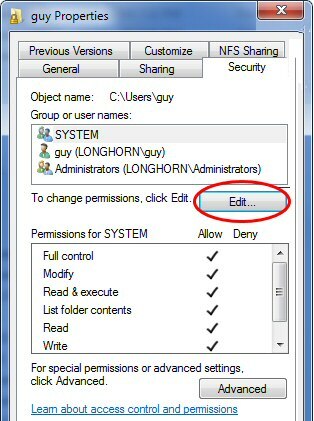 In addition to the file system you can also direct Get-Acl to list permissions on registry keys. This reveals the sister command Set-Acl. Incidentally, many of PowerShell’s Get verbs also have a ‘Set’ companion cmdlet. Get-Acl is rather different from the mainstream PowerShell cmdlets. You can apply what you learn about ‘Get’ access control lists, changing permissions with Set-Acl.